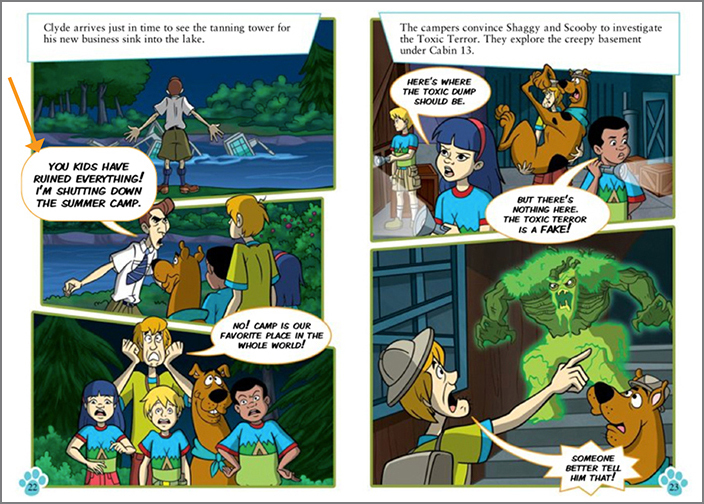 Left, a spread in Kindle Fire flat view; on the right is the same spread, with text popped up. From My Little Polar Bear by Claudia Rueda. E-book adaptation by BNGO / Kevin Callahan; print design by Marijka Kostiw. Scholastic Press. Fixed-layout e-books are much more open to design possibilities than are reflowables. Fonts are locked in, size is not changeable, and text and art are placed with specific location markers so that they mirror the print edition. The user has almost no opportunity to change the appearance. One feature of fixed-layout e-books is to allow the designer freedom to create a book that will appear as designed regardless of the platform. Another is the readaloud feature, which syncs between audio narration and the text. For fixed-layout books on iBooks and similar tablet reading applications, the reader pinches and zooms to enlarge the text or art. For some picture books created for Kindles, the user double-taps a section of text and it pops up at a larger size. Comic books use a different technology; they expand sections of a page in a panel-by-panel progression. I've published a course on Lynda.com that's all about creating fixed-layout books for the Kindle. Click here to view sample videos or the whole course. 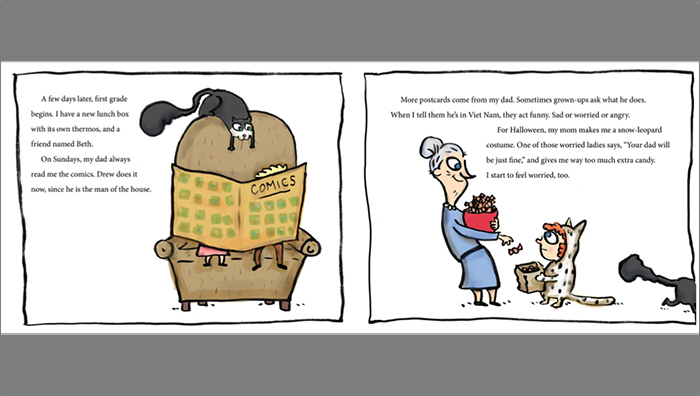 This is the flat view of a spread from Swing with Me in My Family Tree. Print book design by Ahmad Dowla. Radish Moon Press. When you pinch and zoom in iBooks, the entire frame enlarges to fill the screen. The context of the text within the spread is lost. Here is a different spread on the Kindle. The flat-view presentation is the same as the iBooks spread. And here is the pop-up view on the Kindle, showing how only the text block expands, leaving the rest of the spread at the original flat-view size. 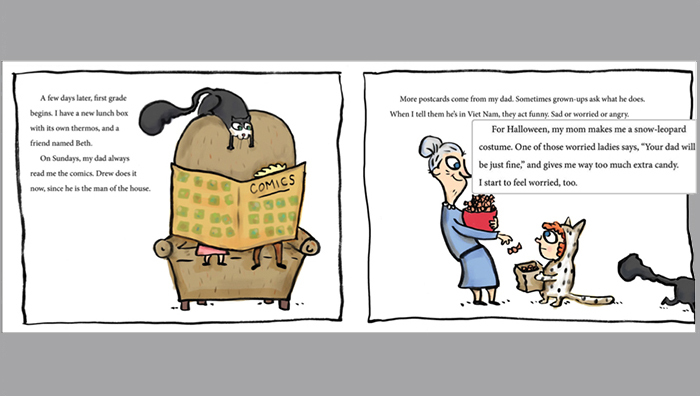 This helps keep the pop-up in context within the spread, so the reader can see how the text fits into the story. Double-tap the text and it pops up for easier reading. 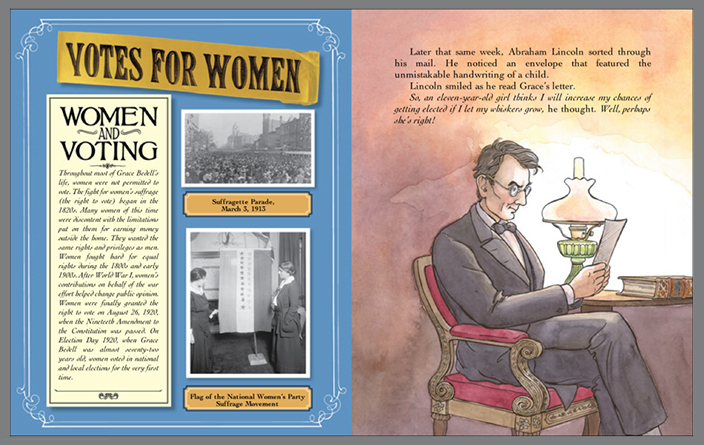 BNGO produces these highly designed illustrated books for print and all digital formats. If a picture book is already in print, BNGO can adapt it and create the digital editions. If it’s a brand-new project, BNGO art directs and designs the print while also planning the digital (or vice versa). Everything from typefaces to size of the original artwork to cover design should be taken into account when planning a dual-purpose publication. Here is a gallery of fixed-layout e-books created for the Kindle. (Double-tap or click on an image to see a larger view and credits.) Pop-ups can be designed to have different backgrounds, borders, and even text or art that varies from the flat view.